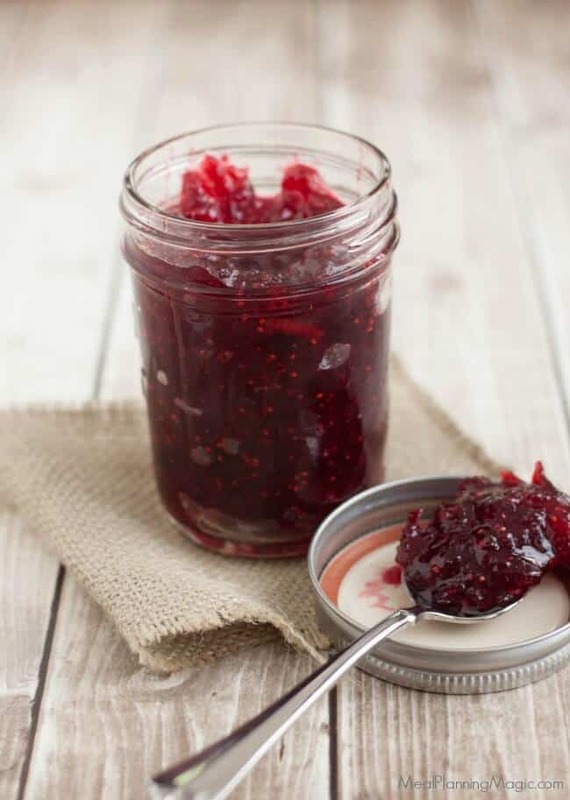 Cranberry Amaretto Chutney is homemade fruit chutney made from fresh cranberries and amaretto. This easy chutney recipe makes a delicious, easy appetizer, dip, or condiment. 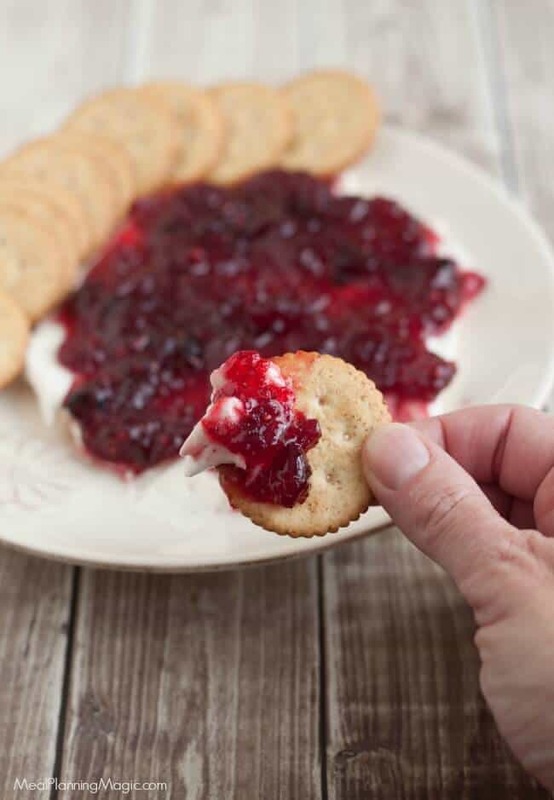 Click here to PIN this Cranberry Amaretto Chutney to Pinterest. 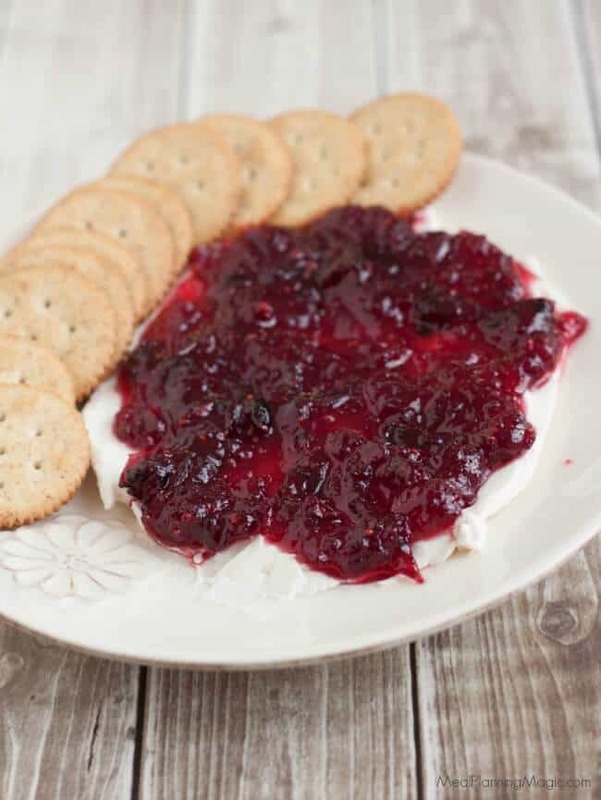 My mom first shared this Cranberry Amaretto Chutney with me and it was SO delicious. Such unique flavors and super easy. I first shared the recipe with you all back in 2012 and it’s just so good I thought it was worth sharing again. It’s originally a recipe from my mom and it’s just so versatile. The best part is how easy it is to make but still be an elegant part of your holiday appetizer lineup. 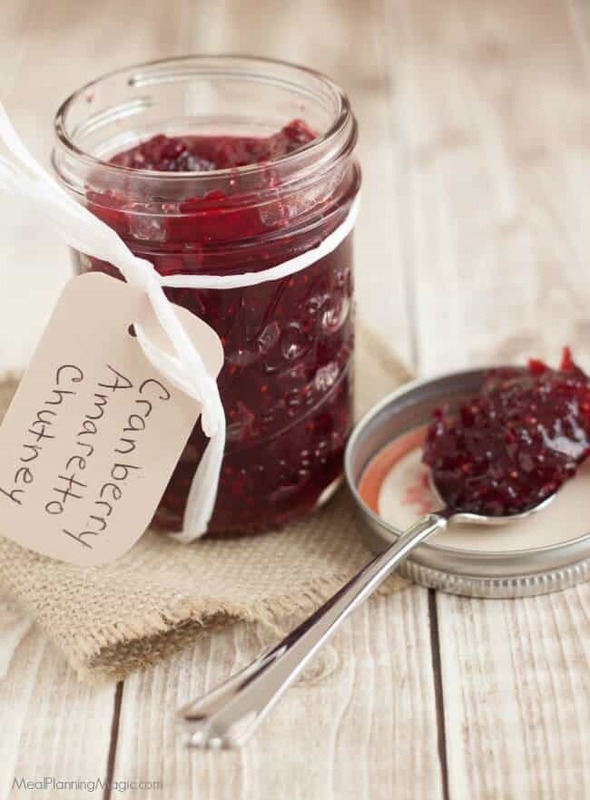 Cranberry Amaretto Chutney is also easy to make ahead. Make up a batch and store it in the refrigerator to pull out when you’re ready to serve for all your holiday gatherings. I normally serve it over cream cheese with crackers but I have also found it is delicious on its own too. While I normally serve it as an appetizer, it’s also great paired with grilled pork or chicken. Add a salad and my Simple Stovetop Brown and Wild Rice Pilaf and you’ve got an easy, elegant holiday meal good enough for company! The tartness of the cranberries and lemon juice paired with the sweetness of the sugar and marmalade and a splash of amaretto just work! The alcohol in this chutney mostly cooks off but it does leave behind a nice flavor that makes the Cranberry Amaretto Chutney have a gourmet taste too. 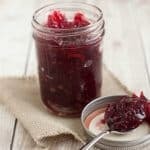 Buying cranberries in bulk makes it even easier to make a large batch of this Cranberry Amaretto Chutney. Find some pretty jars and make a tag so you can give it as gifts too. For more food gift inspiration, check out my 50+ Fabulous Food Gift Ideas roundup post by clicking here. 1 T orange marmalade I have subbed apricot jam before too and it's tasty! Combine 2 C cranberries and sugar. Heat until it comes to a boil stirring constantly. Lower heat and simmer for 20 minutes. Remove from heat and add the rest of the ingredients(not the cream cheese). Let cool and pour over cream cheese block or you may spread cream cheese in a shallow dish and spread cranberry mixture over the top. Sometimes I only use one block of cream cheese to serve. It just depends on the proportion of chutney to cheese that you like. Also, even though the original directions call for you to stir the amaretto into the boiled cranberry mixture OFF the heat, I will bring it back to a boil so some of the alcohol cooks off. Just remember that if you will have children (or others who are alcohol averse) around who might be sampling this appetizer! This looks incredible! Great choice for the week! Amazing…what a combination of great flavors. I will definitely be making this over the holidays! Wish I would have found your hop earlier!! I’ve never made chutney but yours looks so delicious that I’ll have to try it. Oh this sounds fantastic, I love Amaretto and cranberries. I’m going to bookmark this for Christmas which is when we eat cranberry sauce in the UK. Oh My this looks good! I love Chutney this time of year! 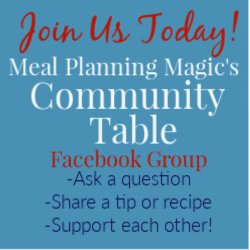 Thanks for sharing and for hosting this each week! I’m not seeing the recipe, am I missing a link? Sorry about that Karen! I have fixed it. 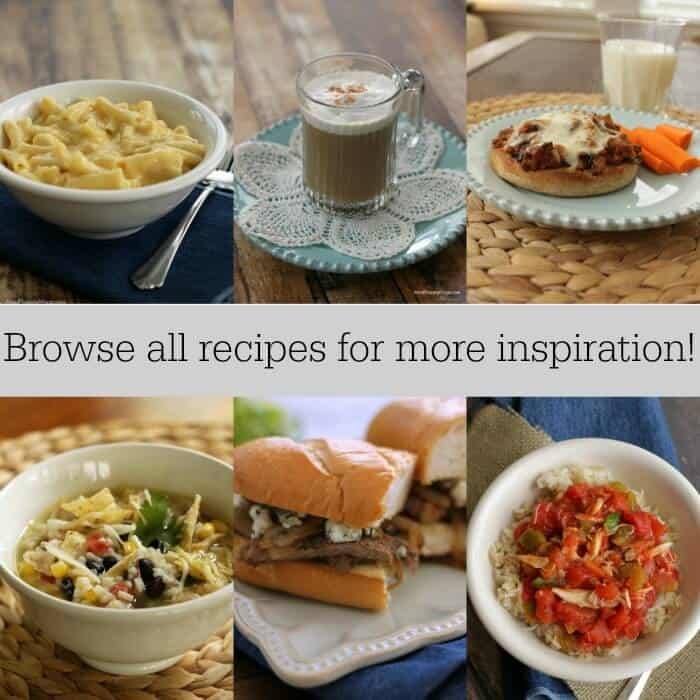 I upgraded to a new format for my recipes and ended up with some duplicates but some of them were blank! Enjoy!